The Cassini spacecraft examines Saturn and the planet's northern hemisphere, which was ravaged by a huge storm for much of 2011. See PIA14905 and PIA14903 to learn more about the storm. Four of Saturn's moons join the planet here. 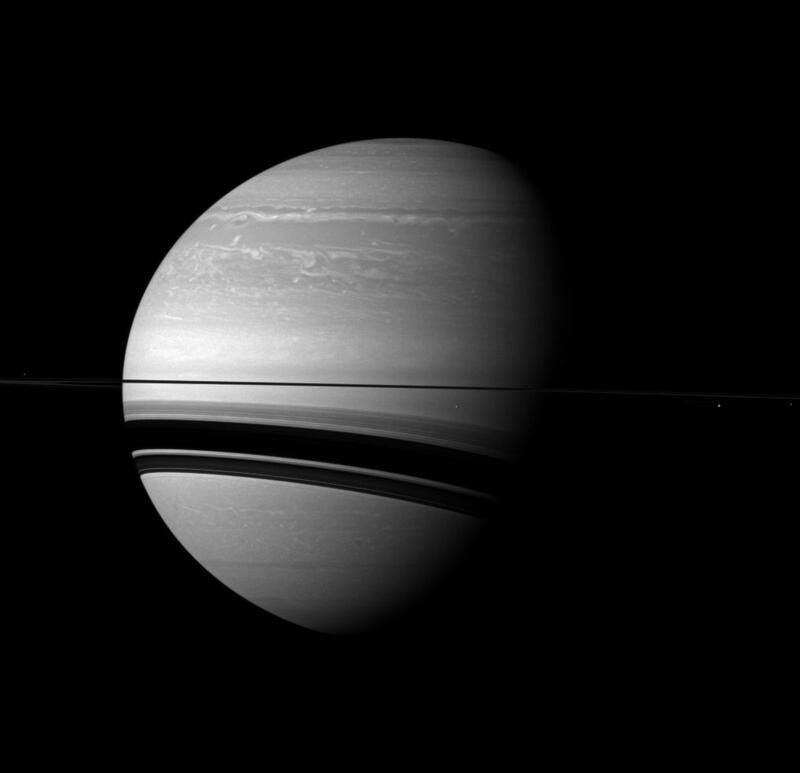 Two of these -- Janus and Epimetheus -- are almost lost in this view due to their small size. Mimas (246 miles, or 396 kilometers across) appears as a bright dot below the rings just to the right of the center of the image. Enceladus (313 miles, or 504 kilometers across) is visible below the rings on the far right of the image. Janus (111 miles, or 179 kilometers across) can just barely be discerned as a tiny speck past Enceladus on the right edge of the image. Epimetheus (70 miles, or 113 kilometers across) is likewise tiny, and can be detected on the extreme left of the image above the rings. This view looks toward the southern, unilluminated side of the rings from just below the ringplane. Relative to Saturn and other objects in this view, Janus and Epimetheus have been brightened by a factor 1.5 and 1.4 respectively. The image was taken with the Cassini spacecraft wide-angle camera on Feb. 11, 2012 using a spectral filter sensitive to wavelengths of near-infrared light centered at 752 nanometers. 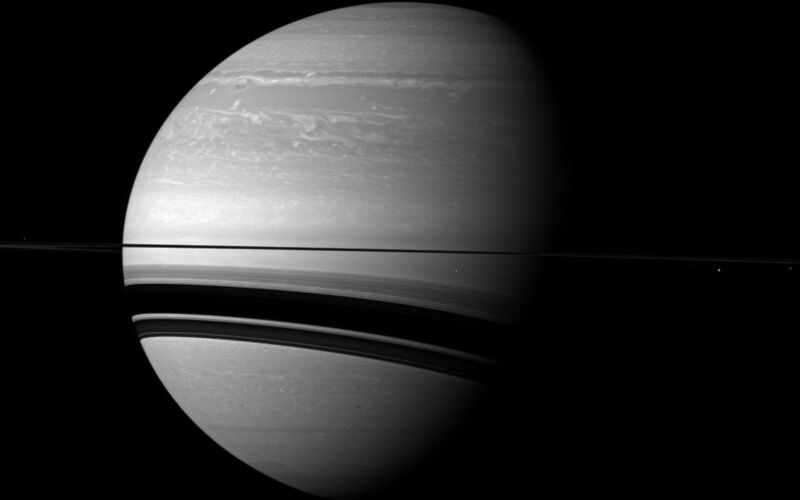 The view was acquired at a distance of approximately 1.7 million miles (2.8 million kilometers) from Saturn and at a Sun-Saturn-spacecraft, or phase, angle of 60 degrees. 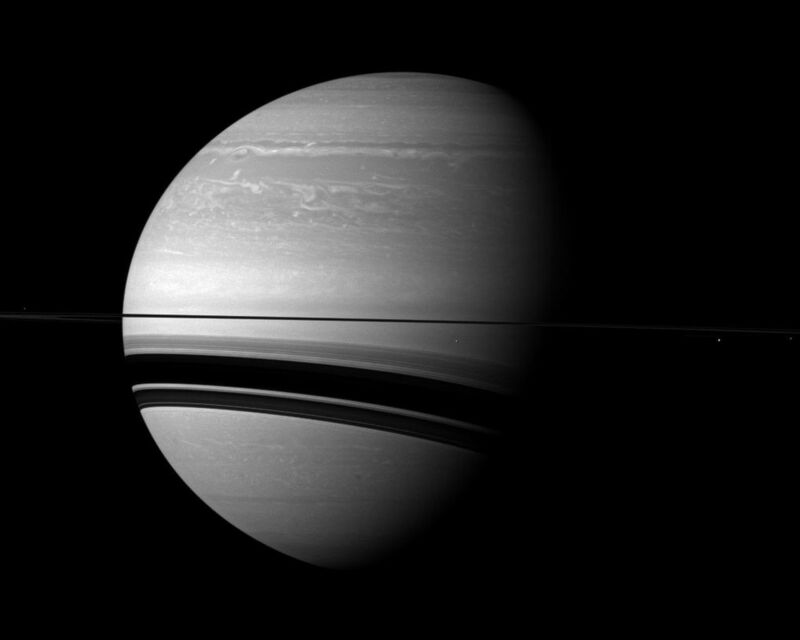 Image scale on Saturn is 105 miles (170 kilometers) per pixel.